Головна An important discovery in the cemetery in Kuty. An important discovery in the cemetery in Kuty. 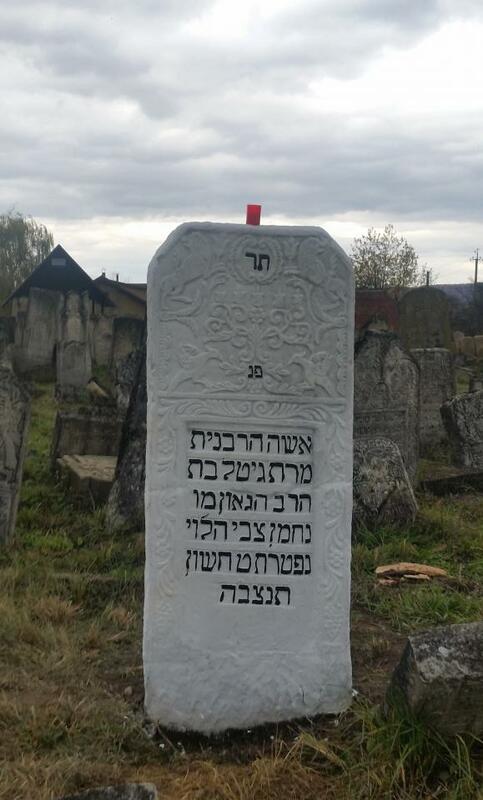 As a result of the documentation work that was performed in 2015 by the delegation in the cemetery in Kuty, the tombstone of Rabbi Yosef Epstein, the rabbi of Kuty (Kutov) in the years 1810-1828, was uncovered, together with that of his wife, Gittel the daughter of R. Nahman Zvi Ha-Levi. After searching through the delegation’s materials (which were collected and catalogued by the organization) these two tombstones were identified by Rabbi Ya'akov Segal of Kiryat Vizhnitz—who has spent years researching the history of the rabbinic families of Kitev. Rabbi Yosef Epstein was born in Kalisz to his illustrious father, Rabbi Eliezer Dov, who moved to the Land of Israel in his later years, a son-in-law of Rabbi Shaul Harif who headed the rabbinical court in Zurawno. Rabbi Yosef's good name preceded him, and upon reaching adulthood he married Gittel - the daughter of Rabbi Nahman Zvi of Kolomyia. Rabbi Nahman Zvi was a descendant of Rabbi Shlomo Luria (Maharshal), and Rabbi Meir Lublin (Maharam Lublin). In his childhood Rabbi Nahman Zvi studied at the feet of the Ba'al Shem Tov, and he is quoted as relating a number of amazing statements in the Ba'al Shem Tov's name. In his book, Oneg Hayim la-Shabbat, Rabbi Hayim Gelehrnter, who served as the rabbi of Kitevh, lists the rabbis of Kitev throughout the generations. He himself notes that the date of Rabbi Yosef Epstein’s death remains unknown, because the letters indicating it were erased from his tombstone. This testimony is verified by a photograph of the tombstone taken by members of the delegation. Over the course of the study, a document was found written by one of Rabbi Yosef’s descendants several generations ago. In the letter he notes that the day of Rabbi Yosef's passing was Friday, Erev Rosh Hodesh Av 5588 (1828), and that his wife, Gittel, died on 9 Heshvan 5600 (1840). Indeed, this date appears on her tombstone. The following words are visible on the tombstones that were found in Kitev: Here lies the great luminary, sharp and illustrious, our teacher, Rabbi Yosef, the son of our teacher, Rabbi Eliezer Dov; Here lies the Rabbanit, Gittel the daughter of the rabbi and sage, our teacher Nahman Zvi Ha-Levi, who passed away of 9 Heshvan. 1. Rabbi Pinhas Epstein, who took over for his father and served as the rabbi of Kitev until 1860; he is buried in Kolomyia. His son-in-law was the Hassidic sage Rabbi Yosef Roth, one of the great hassidim of Kosov and Ruzhin, who authored the books Yeshu'ot Yisrael and Magdil Yeshu'ot. He was active in arranging for the rabbi of Ruzhin to settle in Sadigura, and in his old age he moved to Safed in the Land of Israel, where he is buried. 2. Rabbi Efraim Fishel of Kalisz. He passed away during his father's lifetime, and his children were raised by their grandfather, Rabbi Yosef, head of the Rabbinical Court in Kitev. The tombstone of Rabbi Yosef's predecessor – Rabbi Avraham ben Yosef, who died in 1810 – was also found. Inscribed on his tombstone was the following: Here lies/The rabbinic luminary/The sage, our teacher, Rabbi/Avraham/son of our teacher and Rabbi/Yosef who passed away/Erev Rosh Hodesh Adar/I 5670. Locating these tombstones enabled Kivrei Zaddikim organization to have them refurbished. Unfortunately, the workers chose to paint the tombstones, and the white paint has undoubtedly marred their artistic value, and caused them irreparable physical damage.